“I can’t wait to go to there again, Mummy,” says my daughter breathlessly, recounting that day’s school trip to a Roman museum. Her topic this term is the Ruthless Romans (why are topics always alliterative?). I’m pleased that she’s so enthused and I pick up the leaflet to find out where it is. Then she tells me the reason. Usually on school trips, they’re banned from bringing spending money, but this time they were allowed £2 each. I’m impressed by how wisely she’s spent hers: a postcard, a pencil and some Roman coins – and she’s brought home some change and a leaflet that was free. I like visiting museum shops as much as she does, providing the stock reflects the theme of the museum. My heart sinks when we find only plastic tat that could have come from anywhere (though usually it’s China). So when we enter the Jersey Museum shop at half term, I’m delighted to find it’s full of educational toys and books relevant to the displays we’ve just visited, and they’re all at pocket money prices. Traditional children’s games, replica wartime memorabilia, old-fashioned puzzles and picture books – we’re spoiled for choice. But of course Laura makes a beeline for the one item in the shop that falls outside of this category: a mood ring. 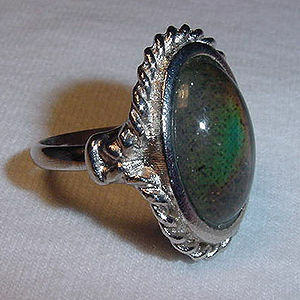 I remember mood rings fondly from my teenage years. There was a fad for chunky stainless steel jewellery and you could buy wide bands with big “moodstones” on top. My friends and I gazed at them as if they were crystal balls, ready to receive their judgement. It would have taken a fast-changing ring to reflect our teenage moods. The 21st century version that’s caught Laura’s eye doesn’t have a stone, but a coloured channel around a silvery band. It’s slim, elegant and subtle. And it’s only £1.25. Laura tries one on and waits for it give its verdict, reading the little colour chart that comes with it. Waiting at her side, I look down at my wedding finger: it’s bare. A few weeks ago, my wedding ring became stuck fast. My hand had become swollen with rheumatoid arthritis and I was starting to fear the loss of circulation. So I forced the ring off – a painful, lengthy job, involving much liquid soap and twisting. (Twist, don’t pull – that’s the secret, for which knowledge I have to thank Mr Google.) I soon decide to get a replacement to keep the gossips at bay – within days people were asking about the state of my marriage. I don’t like flashy, expensive jewellery and I do like a bargain, so our half term trip to Jersey, famed for its VAT-free status, seems the perfect perfect opportunity to find one. By now, Laura’s fishing £1.25 out of her Hello Kitty purse and heading for the till. I pick out the largest size in the cardboard display and slip it onto my own ring finger. It’s a Cinderella moment: a perfect fit. I catch her up at the till. 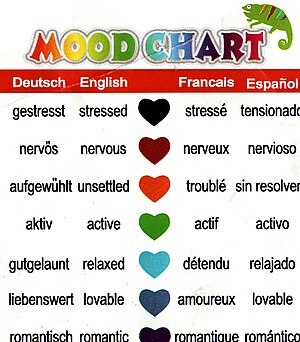 We spend the next few hours comparing our moods, according to our new rings. “I’m normal and lovable now,” Laura reports earnestly – so no change there then. I plan when I get home to show my ring to my husband. (We’ve left him at home to do the decorating.) I think I’ll give him a copy of the colour chart and the advice to check my ring every time he speaks to me. The wisdom it imparts could seriously improve our relationship. Maybe mood rings should be compulsory in all marriages, or indeed prescribed by Relate to those who fall out. In the meantime, he’s looking forward to a navy blue moment.